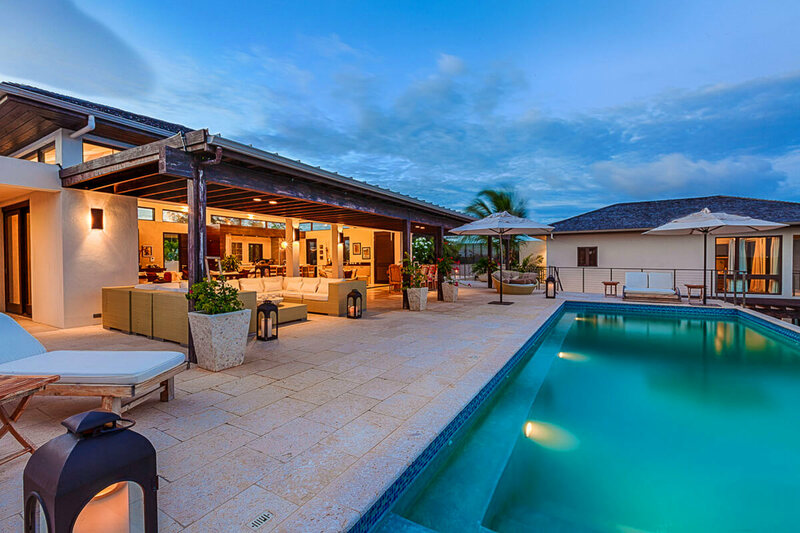 Situated at the water’s edge on the south end of Anguilla, Aquamarie villa takes advantage of its location to offer the best possible views of the island. Aquamarie is a non-smoking property that is fully handicap-accessible. You can laze in the afternoon sun around the pool or walk along a private pathway to the cove beach. There you’ll find cushioned daybeds built for two, beach chairs, and umbrellas to keep the strongest rays at bay. While you’re here, be sure to take advantage of the outdoor garden showers. Another “not to be missed” experience is swimming after dark. The underwater lights and the moon and stars overhead provide a dramatic backdrop for an end to your day. Amenities appealing to all ages! Aquamarie Villa sits steps away from Kamique’s secluded beach and overlooks the sea and St. Marten’s mountains. This vacation rental is wheelchair accessible and enjoys daily housekeeping. This villa has direct access to a private cove that is protected by an outer reef. Umbrellas, chairs, and day beds are available for on the beach, and there’s snorkeling gear to take under the sea. At the villa, there’s a full deck for indoor/outdoor living and dining around the large pool. Two shaded gazebos and a hammock hanging between two palm trees on the lawn provides more lounging space. A blend of woods, stone, and concrete creates a modern, tropical environment. There is an open plan kitchen fully outfitted with stainless steel appliances and an espresso maker. The media room has a powder room, comfortable seating, a large television, and many video and board games. Amenities from around the globe, like Jerusalem stone flooring, Indonesian furniture, an Italian kitchen, and Egyptian cotton linens, elevate Aquamarie’s luxury. Two master suites are located in separate wings on the first floor. On the ground floor, guests will find a mini master suite with ocean views. Its ensuite bathroom connects to a garden view bedroom with two queen beds. This bedroom is good for guests with small children. Every suite has stunning ocean views, floor-to-ceiling windows and sliding glass doors, a flatscreen TV, and exterior access to the balcony. The spacious bathrooms have indoor and outdoor showers. Aquamarie villa has signing privileges at CuisinArt Resort and Spa, except during the Holiday Season. It’s a 5-minute drive to the nearest restaurants and groceries, but still feels private. Ground transfers to and from Anguilla port of arrival. Continental breakfast and unlimited free calls to US and Canada.